We are in the height of zucchini and summer squash season right now and while it is overwhelming at times, it’s also a huge blessing. My grocery budget is happy! Because we often have a problem with vine borers, I try to begin preserving zucchini and yellow squash at the beginning of the season. Anything we don’t eat fresh I’ll preserve. That way if the plants get destroyed from the vine borers, we’ve enjoyed some fresh and have some preserved for the winter. If the plants survive the vine borers, then we also have enough to share. I like to preserve zucchini and summer squash in a variety of ways based on how we like to use it. I’ve experimented quite a lot over the years and I’m pretty comfortable with knowing about how much summer squash we need to preserve so we can add it to soups, and make fritters and zucchini bread for the year. 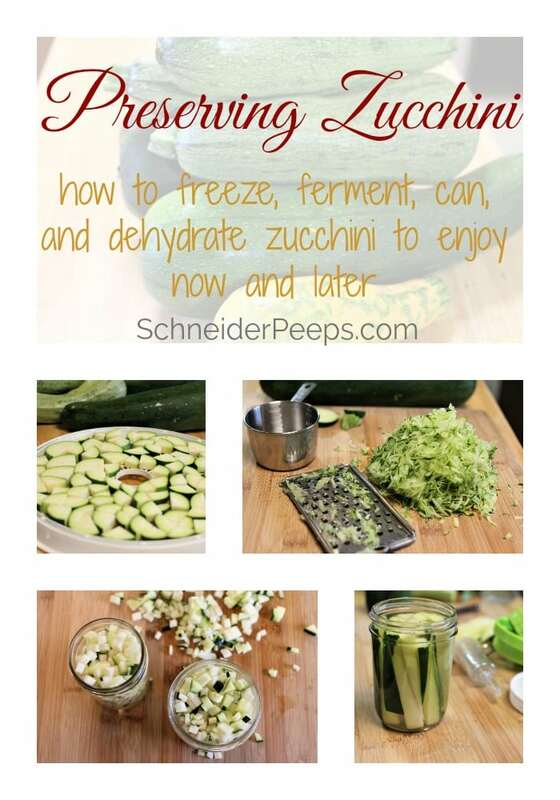 What you need will probably be different but these ways of preserving zucchini should be a great starting place for you. 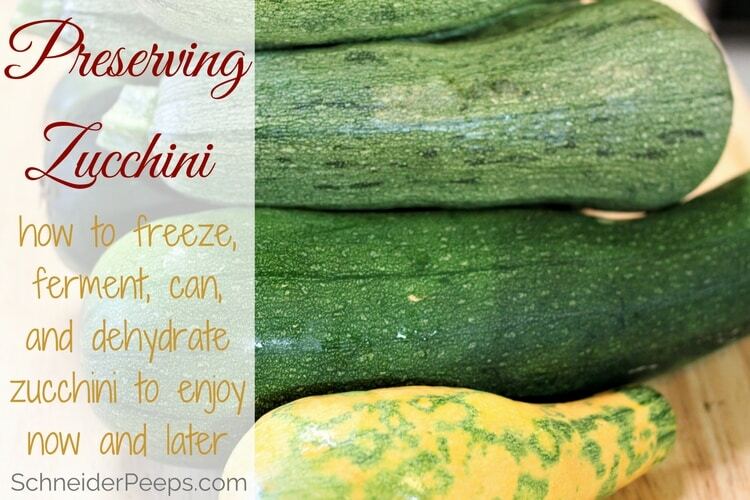 I use zucchini and yellow squash interchangeably when I’m cooking and preserving. However, I don’t preserve white patty pan squash. I find the rind is a bit thick for our liking. There are several ways to freeze zucchini and what you want to use your frozen zucchini for will determine how you freeze it. You can blanch or not blanch your zucchini. If you’ve read some of my other preserving posts you know I’m somewhat of a rebel when it comes to freezing vegetables in that I don’t blanch them. If there is something that absolutely has to be blanched in order to freeze well, I don’t freeze it. I’ll use a different preservation method. You can freeze zucchini in chunks or grated. If you choose to freeze it in chunks, I’m going to suggest you blanch it, then lay the chucks out on a baking sheet with parchment paper or a silicone mat and freeze it. Once it’s frozen you can transfer it to ziplock bags. This will keep it from freezing into a one large block. You can add these chunks of frozen zucchini to soups, stir-fries or casseroles. If you freeze grated zucchini, you can blanch it but I don’t. I use frozen grated zucchini for things like zucchini bread, brownies, and fritters. The texture of thawed grated zucchini is fine for baking and frying up in fritters. When the zucchini thaws there will be a lot of water that is released. If the recipe does not tell me to salt the zucchini and let the water drain, then I add the zucchini water to the recipe. So, when I make zucchini bread or brownies, the thawed grated zucchini and the water goes into the batter. However, when I make fritters using frozen zucchini, I don’t add the water because the recipe says to salt and drain the water from fresh zucchini. 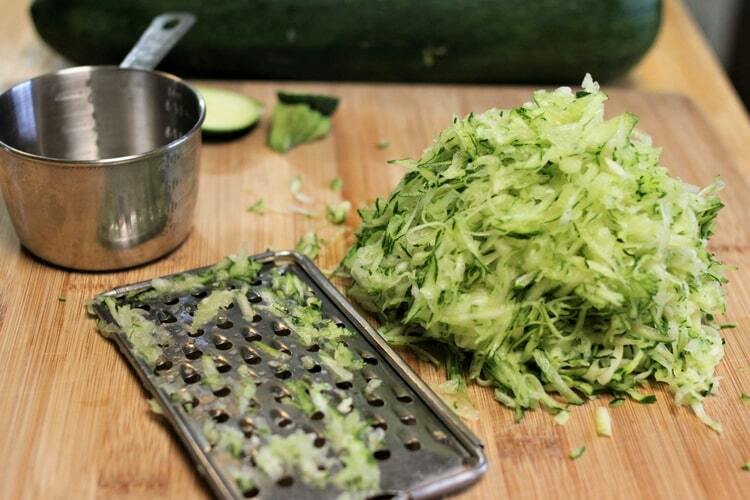 Some people will salt and drain the grated zucchini and then freeze it to save freezer space. If you’ve never frozen zucchini before you might want to try both ways and see which way you like better. To freeze zucchini, I just grate it and put it in ziplock bags. I put two cups of grated zucchini per bag and label it. This is the amount I need for zucchini bread or brownies and I can grab several bags to make fritters. We lay them flat to freeze and they don’t take up much room at all. To thaw, take the frozen zucchini out of the freezer and either put it on a plate and let it thaw on the counter, or put the bag with the frozen zucchini in the sink with hot water to thaw it out quicker. 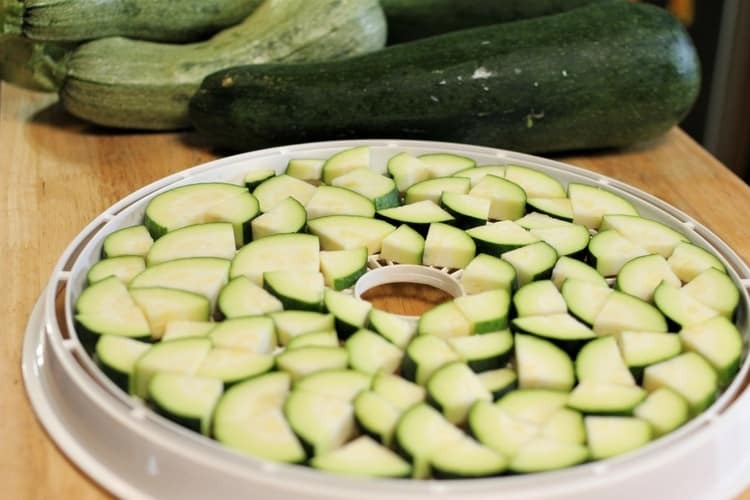 To dehydrate zucchini, slice the zucchini in 1/4″ rounds (or thinner). I actually like to cut the zucchini lengthwise first and then again so the rounds are really 1/4 of a circle each. I tend to dehydrate our larger zucchinis and full circles are a bit big for soups. Put them in your dehydrator and dry for several hours. They should be completely dry but not brittle. If you don’t have a dehydrator, you can dehydrate them in your oven set at 150°F for a couple of hours. Just lay them out on a rack or baking sheet. You may have to turn them if you put them on a baking sheet and you’ll have to keep a close eye on them. After the zucchini is dry, put in an airtight jar or ziplock bag. I store mine in the freezer simply because we live in a humid area and I don’t want to take any chances of them molding. But if you’re sure all the moisture is out, they are shelf stable and don’t need to be refrigerated. Some people like to put moisture packs in their dehydrated produce. Here is a way to make your own moisture packs. During the winter I like to toss dehydrated zucchini into soups. They don’t look super pretty but they taste great. If you slice them very thin, you could season them and dry them out for zucchini chips; a mix of garlic, salt and pepper, and possibly some spicy pepper like cayenne would be nice. You could also soak them in lime juice or apple cider vinegar and then dehydrate them for a tasty snack. I recently made the zucchini gummy candy in this post and my children who like gummies really liked them. I’ll be making more soon. Canning zucchini is a bit tricky. 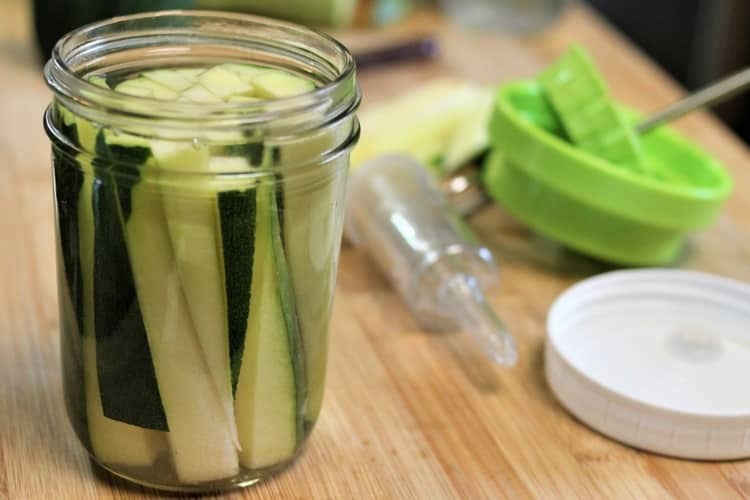 In order to can it without vinegar you would need to use a pressure canner which would turn the zucchini into mush. You can try it if you want but I’m not sure what you would use the end product for. So, most people can pickled zucchini. Pickled zucchini is usually a little softer than pickled cucumbers but it’s still good. Zucchini pickles are best made with freshly picked zucchini, they’ll be a bit crunchier. Also, smaller zucchinis are better if you’re going to make pickle slices. You can always put a grape leaf in the jar to help them be crunchier. Since we’re not big pickle eaters I like to make a few jars of zucchini relish. I chop the zucchini really small and then use my granny’s bread and butter recipe to make a sweet relish. I like to ferment some zucchini sticks for snacking on. Not all of my family enjoys them but some of us do so I do a few pints each summer. Fermenting vegetables is so much easier than canning. I like to use an airlock system and mason jars, Himalayan salt and water. We have a well so don’t need to worry about chlorine. If you have chlorinated water you’ll want to use bottled water or let your water sit out for a day or so the chlorine can evaporate before using it. 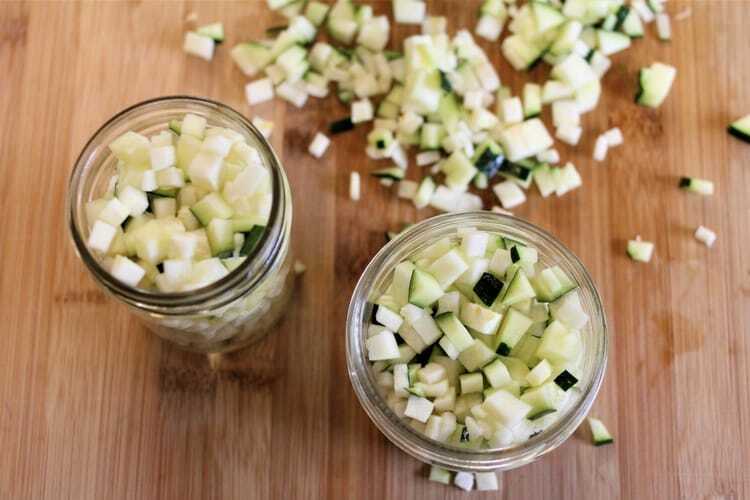 Slice the zucchini in rounds or sticks and put in a mason jar. Make a 2% salt brine, and pour the brine over the zucchini. Put a weight on the zucchini sticks to keep them below the brine – if you are using a system that needs a weight. Then add the lid and airlock and store in a cool, dark place for a week or so. After a week test the pickles to see if they have fermented enough for you. If so, replace the airlock with a regular lid and store in the refrigerator. You can add garlic, dill or other herbs to your fermented zucchini but don’t try to make them sweet. The sugar will cause them to turn into wine. Preserving zucchini and summer squash in a variety of ways is a wonderful way to cut your grocery bill and ensure your family has organic food through the winter months. What are some of your favorite ways to preserve zucchini and summer squash? I am thinking about canning Zucchini soup, making it up to a point,then canning it through a hot water bath..perhaps at the point I stop it would have the zucchini,potato sauteed onion and the liquid, salt,at this time put into the jars and process it.When I open the jar, heat and proceed with the milk or cream. How do you think this would work? Have froze the chunks before and have lost it through transportation,we go to Florida for the winter and would hate to not have my harvest of zuke’s. Hi Jo, the National Center for Home Food Preservation doesn’t recommend canning zucchini unless it’s pickled. You can read their information here. I like to dehydrate zucchini and use that in soups in the winter. It reconstitutes just fine. Hope that helps. Thanks for the information and link, Jeannie. The author sites the same article from NCHFP about not having documentation on how long to process summer squash in order to can it safely. The problem is we don’t know that a 25 minute process time is adequate or not. Of course, we all need to do what’s right for our family and I’m glad that you found a good solution for your family. However, I only share proven safe food preservation methods because for our family it’s just not worth the risk, we can always just freeze or dehydrate the squash and it works just fine for cooking.